On November 17th in Los Angeles, these words were spoken by the United States Surgeon General. They are without a doubt some of the most powerful words I've heard in the past year. Addiction is a health issue, not a moral failing. Period. I have waited 28 years—the entire time of my own recovery from addiction—for a moment such as this. America’s top doc has thrown down the gauntlet. His report, called Facing Addiction in America: The Surgeon’s Report on Alcohol, Drugs, and Health, lays out key findings about neurobiology of the brain, along with what the brain science means for prevention, treatment and recovery. The report also takes a look at health care systems and provides a vision for the future. This future includes integrating prevention into primary healthcare and that results in a focus on wellness vs. sickness. What a concept! I was there in person for several reasons: First, because the summit represented a defining moment for the collective addiction space—prevention, intervention, treatment and recovery. Second, Drug Prevention Resources needed representation at the summit as we continue to position ourselves as leaders in transforming the work of prevention in North Texas and throughout the state. Finally, I remember the significance of the original 1964 Surgeon General’s Report on Smoking and Health. Look how far we've come in reducing smoking since that report was issued. This new report is being heralded as equally important in its impact on society. 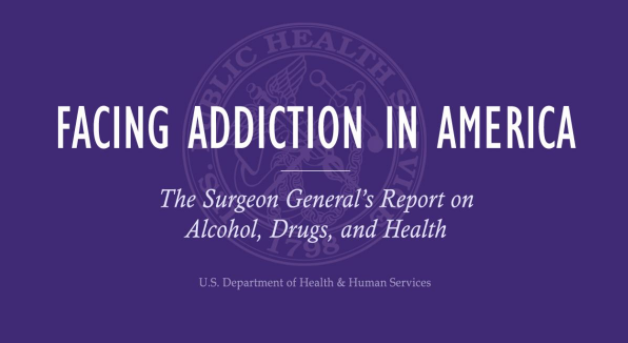 I love the Surgeon General's call for a cultural shift in how we think about addiction. Most of us know that stigma surrounding the disease of addiction makes it more difficult for people to seek help. But did you realize that stigma makes it more challenging to marshal much needed investments in prevention? We see this when schools are reluctant to add prevention programs on their campuses because of what parents will think. Yet parents tell us every day that their kids need more prevention education. Most tragic, however, is when a student in an alternative school asks one of our prevention specialists, "Why weren't you in my home school so I could learn these skills before I ended up here?" We all know that the effects of substance use are costly for our society and impact all of us in one way of another. This report scientifically proves that prevention does save lives and also provides evidence that our long-standing programs and prevention efforts are very effective. Some examples include using community-based coalitions to plan and implement effective prevention interventions at the local level (we have six coalitions and just received funding for a seventh). Drug Prevention Resources already has many of the Surgeon General’s strategies in place. Our community coalitions all focus on community level change and we've seen a lot of successes. However, because one in seven people will develop a substance use disorder at some point in their lives, we must be vigilant and constantly willing to approach prevention in new and different ways. Everyone has a part to play in solving this epidemic. It is my hope that everyone who reads this report will be inspired to take action. If you want to know how you might be able to help, please contact me, and I'll be happy to talk with you about opportunities.